Eight years ago, officials with the city of Jarrell decided their small community north of Austin needed a new wastewater system. They expected an influx of new residents and businesses to support some debt to pay for the project. As of 2013, Jarrell’s $10.3 million debt works out to $9,928 for each of the community’s 1,035 residents. It is one of the highest per-capita debt loads among Texas cities, which mostly have debt loads of less than $1,000 per resident. In recent years, nearly all of Jarrell’s property taxes — 39 out of 44 cents per $100 of assessed value — have gone to paying off debt, Yantis said. That’s meant holding off on other projects, like expanding the police force. Yantis expects the payments to drop significantly around 2021. Residents will notice the difference pretty quickly. Jarrell’s story is an extreme example of the way hundreds of Texas communities are relying more on borrowing to handle basic public services. Over the last decade, local government debt has grown around the country, but Texas, with an economic performance in recent years that has outpaced the rest of the country, is a special case. Of the 10 largest states, Texas has the second-highest local debt per capita as cities and school districts have gone on a borrowing spree to maintain or expand amenities while not raising taxes. When communities are short on cash, local officials can choose to sell bonds to private investors, promising to pay it back later with interest. There are two main types of local debt issued in Texas: taxpayer-supported debt, which is backed by local property taxes, and revenue-supported debt, which is typically used to finance infrastructure projects and paid back through sales taxes or user fees. While both types of debt have grown in Texas in recent years, critics have expressed more concern over taxpayer-supported debt, which is usually voter-approved and can be tougher to pay off if projections for economic performance or population growth don’t pan out. Between local cities, school districts and counties, more than half of all Texans live in areas where the bill for taxpayer-supported debt, including expected interest, totals more than $1 billion, according to state data analyzed by The Texas Tribune. In parts of the state’s two most populous counties — Harris and Dallas — the total cost of local debt tops $5 billion. In many cases, local communities are counting on expected population growth and the success of new businesses to bring in more tax revenue, allowing them to paying off the debt years ahead of schedule. Yet if that growth doesn’t pan out, that strategy can shift the burden to taxpayers, potentially decades into the future. 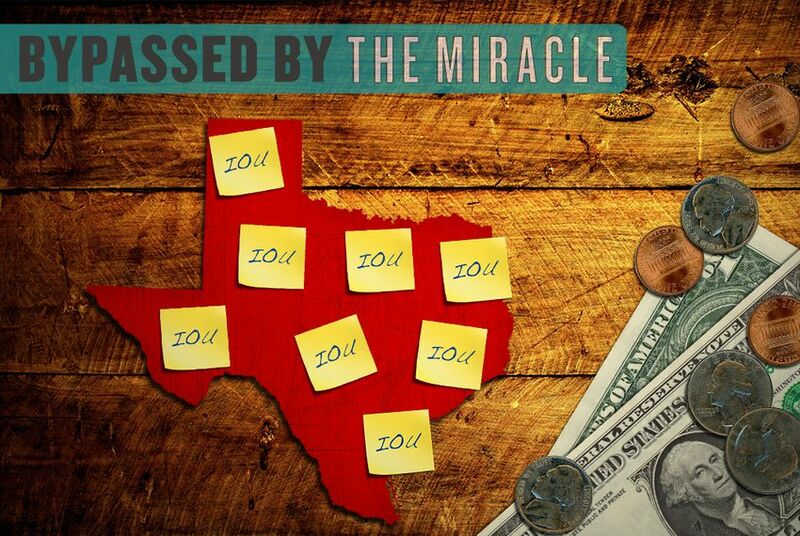 Many local officials argue that issuing debt is the only option to maintaining essential services as Texas gains more than 1,000 people a day. “Texas does a really good job of bringing people to Texas but not a very good job of supporting the local infrastructure, like schools and libraries and parks and all those things that make people want to stay in Texas once they get here,” said Michelle Smith, executive director of the Fast Growth School Coalition. Over the past decade, the growth in local debt in Texas has far outpaced the growth in population, state records show. Across Texas cities, tax-supported debt has grown 78 percent since 2004, while the population grew by just 18 percent. It’s a similar story with the state’s counties, with tax-supported debt held by counties growing by 58 percent since 2004. The growth in debt is most pronounced for the state’s school districts. Between 2004 and 2013, the student population at Texas public school districts has grown 14 percent. During the same period, voter-approved tax debt for school districts has grown 97 percent, from $32.6 billion to $64.2 billion. Reasons for the rise in debt are as varied as the communities that have issued it. Through conversations with local officials in dozens of communities, a few larger trends emerge. Fast-growing communities and school districts have seen some of the largest increases in taxpayer-supported debt levels. As the “Texas miracle” has drawn tens of thousands of people from other states and countries to the city’s major urban areas, nearby suburban communities are taking on an outsize share of the transplants, many drawn in by the availability of larger homes and better schools. Cities are obligated to provide certain infrastructure for new subdivisions, such as sewer connections and roads. School districts need to find space for new students, either by investing in new facilities or in temporary additions known as portables. The new tax revenue to pay for those new services often doesn't reach local coffers until after new residents have moved in. That’s the situation in Frisco, the nation's second-fastest-growing city from 2012 to 2013, after San Marcos. Frisco ISD is also one of the country’s fastest-growing school districts. Both the North Texas city and the school district have some of the state’s highest debt levels. Frisco Assistant City Manager Nell Lange said roughly half of the city’s debt over the past decade has gone to pay for new roads. Much of the remainder has gone to connecting new subdivisions to sewer lines and other basic amenities. The property taxes from those developments usually take about 18 months to show up on the city’s tax rolls. “We’re developing in pockets around town, and part of the issue is we don’t have roads out there yet. We don’t have sewer out there yet,” Lange said. Frisco ISD began the new school year this week with a new high school and four new elementary schools. In May, voters approved a $775 million bond package to cover the costs of 14 new campuses, including three more high schools. Smith said Frisco ISD is one of a few dozen so-called destination school districts in the state that take in 80 percent of the 80,000 new students Texas gains each year. “We’re talking about thousands of kids walking into the door every school year and families expecting there to be a desk for them,” Smith said. Another destination district in North Texas is Allen ISD, which became the prime target of spending critics in 2009 after 64 percent of the district’s voters approved a bond package that included $60 million to build an 18,000-seat football stadium, one of the most expensive high school stadiums in the country. That project became a national punch line this year when cracks in the concrete forced the district to shut the stadium down until 2015. Lawmakers and others have cited the plagued project as an example of lavish spending on the part of debt-addicted school districts. Allen district spokesman Tim Carroll said the district had grown out of its old stadium, which only seated 7,000 people but routinely drew more than 15,000 attendees to games. Regardless of the wisdom of that project, building stadiums makes up a small part of what school districts are using with borrowed money. The vast majority of spending is going to construct or upgrade schools and other facilities, or to purchase new equipment like buses, according to school officials. That’s true even in rural districts or ones with relatively stable populations. Many communities with flat growth are still finding reasons to issue debt, often to finance infrastructure improvements or to pave the way for possible growth. Carl Jones, city manager of Prairie View, a community of 5,700 people 40 miles northwest of Houston, said much of the city’s $4.5 million in debt is tied to upgrading water supply and other infrastructure that dates back to when the city was incorporated in 1969. Prairie View opted to borrow the money because taxing residents upfront to raise it was not practical, he said. In some cases, local communities are taking on large amounts of debt now for fear that a once-in-a-lifetime opportunity will pass them by. The Wellman-Union Consolidated district, which is outside Lubbock, has $95,000 in debt per student — one of the highest in the state. The rural district’s voters approved all $19 million in debt in 2013, much of it for new facilities, even though the student body has stayed at around 200 since 2009. “It looks like we’re building about 10 new classrooms and we’re renovating about 12 or 13 classrooms,” Superintendent Dwayne Chenault said. Chenault explained that the regional oil boom has boosted the district’s property tax revenues, making the time right to invest in the district’s future. The goal is to pay off the debt in less than 30 years, he said. For some communities, a high level of debt can be somewhat misleading, as the state has effectively encouraged the borrowing. In Titus County in rural East Texas, for instance, voters approved $146 million in bonds over the last decade to build a highway loop and cut congestion on U.S. Highway 271. Titus County Judge Brian Lee stressed that the project is part of the Texas Department of Transportation’s Pass-Through Financing Program, which the state employs to stretch its limited transportation budget by having local communities pay costs for a highway project upfront. TxDOT pays them back over time. “Yes, it does look like we have an extraordinary amount of debt, but we have a guaranteed form of repayment,” Lee said. It’s a similar situation in nearby Boles ISD, one of the state’s poorest school districts. Boles has nearly $7 million in debt, all related to paying for new or upgraded facilities. But Superintendent Graham Sweeney said the district would probably not have borrowed the money if not for state programs that defrays certain infrastructure debt costs of poorer school districts. While local debt has grown significantly statewide, some communities have bucked that trend. The city of Tyler is the largest in the state with no taxpayer-supported debt, paying the last of it off in 2008. Since then, city leaders have found that freeing the city up from those debt payments has enabled it to make better use of its surpluses, paying for major projects like two new fire stations and a new parking garage with cold hard cash, Tyler Assistant City Manager Susan Guthrie said. “It allows us to adjust our operations on the fly and make better decisions for the taxpayer,” Guthrie said. “If you have debt, you have to pay that debt off first." Disclosure: The Fast Growth School Coalition is a corporate sponsor of The Texas Tribune. A complete list of Texas Tribune donors and sponsors can be viewed here.